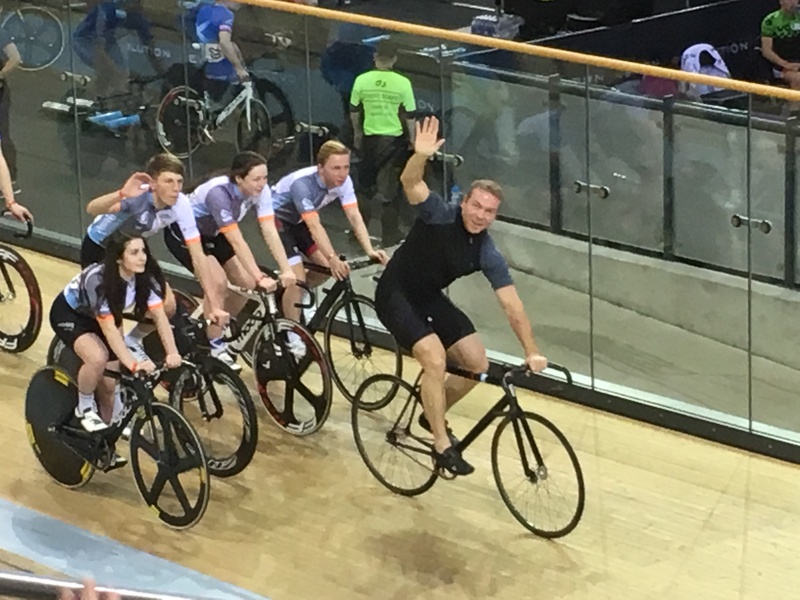 For our first ever none riding trip away we went to the Sir Chris Hoy Velodrome in Glasgow to Round 4 of the Revolution racing series. 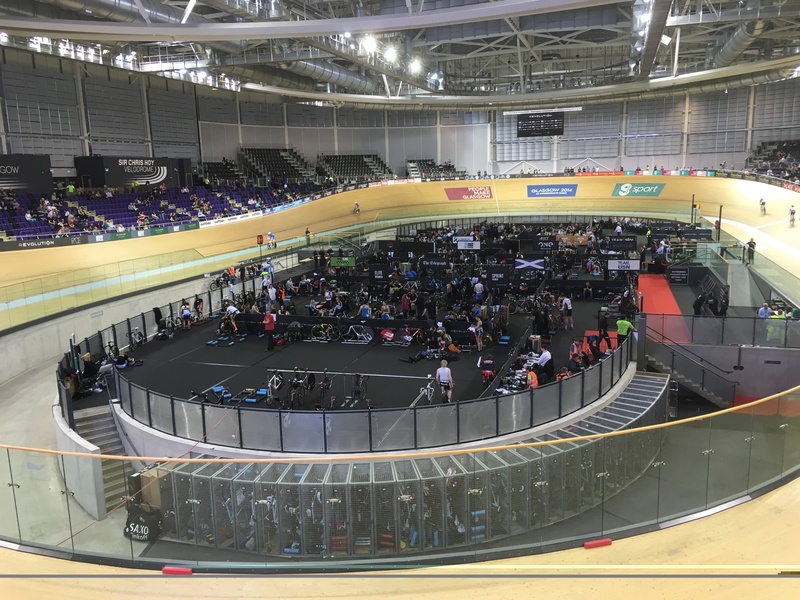 A swifter than expected (2hrs 45 mins) drive up from Durham city saw us arrive at the velodrome a little before the doors opened to spectators so we partook of the refreshments available from the cafe in the main foyer. Getting there early meant we got chance to have a chill (pretty literally as it turned out) and gave us the time to have a look around at the stalls and catch up with other North East contacts. 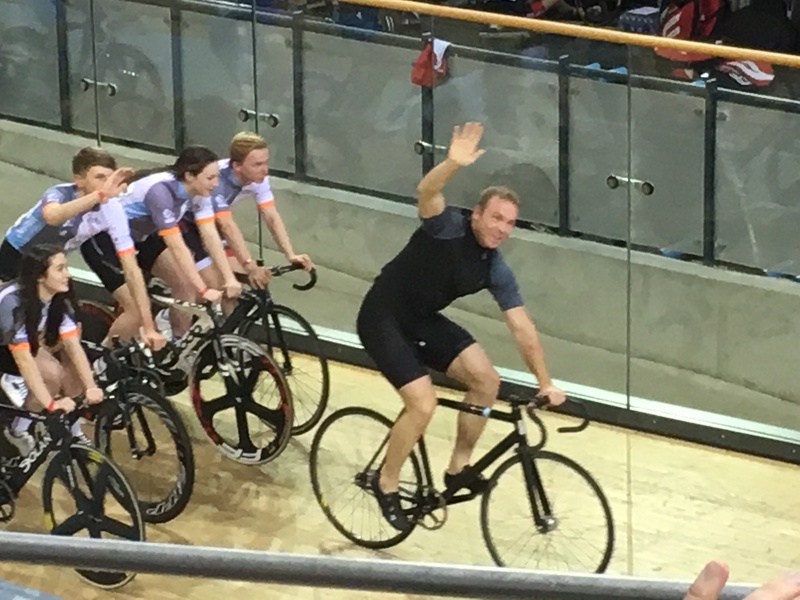 Upon opening the doors to the track itself Neil was heard to say “My god its hot” and that from a man who has spent plenty of time at Manchester and other velodromes. 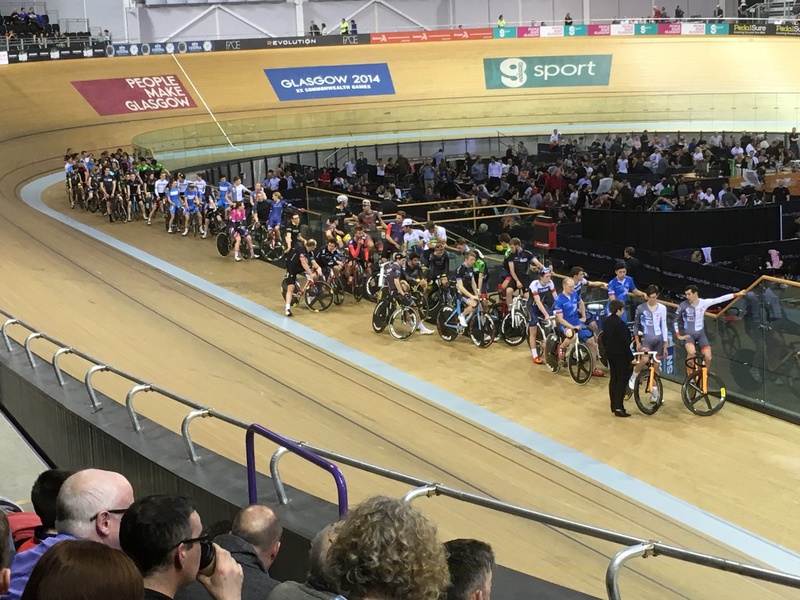 For those of you who may not know the organisers have the velodrome hot as hot air is thinner thus meaning riders go faster. Once getting over the heat we wandered to the top of the banking and it was noted, again by Neil, that it was much steeper than Manchester and that the straights were longer. Most velodromes are now 250m but angles vary and steeper banks do then give longer straights. And so it came tome to find our seats in the wonderful arena and settle down to a full 2 and half hours of fairly none stop entertainment. Gail afterwards commented that she hadn’t expected there to be so much continuous action. Getting to see the Star names of Geriant Thomas, Ian Stannard, Adam Blythe , Laura Trott and Katie Archibald was great. 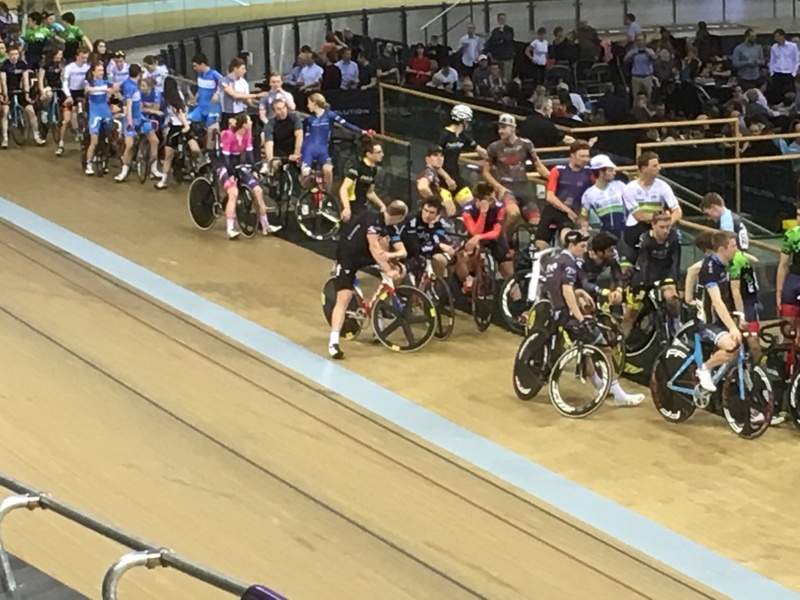 Along side this all Revlolution rounds fearture the Future Stars 15 + 16 year old riders showcasing the depth of talent that GB has at the moment. Tyler and Oran and lucky to know two of the riders, Hamish Turnbull and Samantha Verrill who are North east riders and sometimes train alongside the boys. This is fantastic for them as it gives them the opportunity to see people they know on the big stage and realise that with talent and hard work they too could someday be in that position. 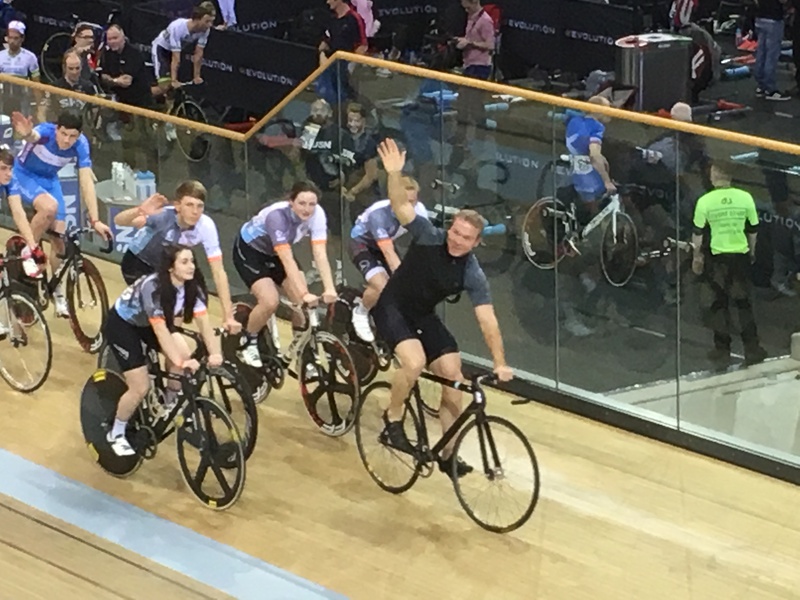 George commented that Laura Trott was his favourite rider of the night as she just oused class not only being supremely fast and powerful but also being fantastic tactically. This entry was posted in Club Events on November 29, 2015 by admin.